Big Bass Fishing? Just What Is Big? For largemouth bass it's a tough life. One that weighs more than five pounds, Like the 7.5 pounder above, which is just one or two percent of all largemouth bass, is a creature deserving reverence from those of us who pursue hawgs. A bass this size has struggled long and survived much in order to reach this size. As a result, in their world they're mean and dominant. When big bass fishing you'll find them shrewd and educated. Conditioned if you will, to avoid anything that seems unnatural or a threat to their safety. They enter a world where it is quite simply a 24-7 matter of "eat or be eaten". From the minute they're hatched they find themselves on the menu of just about every other carnivorous creature in the lake or river. Numerous studies show that out of 10,000 eggs laid only 1 to 3% may survive to reach 10" in length. A newborn bass fry has small chance of surviving to adulthood, that being 3 to 4 years old, 17" to 19" inches long and weighing somewhere between two and four pounds. If the male picks a bad place for building a nest, such as one where turbidity is significant, the amount of light that reaches the eggs can be insufficient for warming the water at a rate conducive to hatching. A bass begins as one of up to 10,000 thousand eggs deposited in the nest. These eggs are immediately subject to intense predation by bluegill but no less so by insects and other amphibian predators. After hatching they are assaulted by any number of different fish, even their own parents. Habitat that provides cover close by, especially weeds in which fry can hide, increases the chances of fry survival. They instinctively head for such protection but often encounter carnivorous predators who await them there. However, lakes that have few weeds make bass fry far more vulnerable to predation. Instability of habitat also impacts survival chances of fry. Heavy spring rain that produces flooding can seriously reduce recruitment. The opposite, drastic water level draw down during spawn, has the potential of completely devastating a year's hatch. First and foremost, growth is dependent on the quantity and availability of forage. Food availability varies seasonally between reservoirs, and even between locations within reservoirs. Areas with abundant grass offer different forage than does an area devoid of grass but with abundant rock structure. So, you can see what it takes for a largemouth bass to reach the five pound mark? So What Is A Big Bass Fish? Depending on where you live and fish, big bass fishing and what is considered a big bass may be different from what may be viewed as a lunker elsewhere. Nevertheless, the broadly accepted threshold where largemouth bass go from "hey dude, good bass", to "damn, it's huge, you gotta hawg, don't horse it, keep your line tight, get the net, get the net! ", is five pounds. OK, OK, I hear you. Florida, Texas and California probably consider that threshold to be seven (7) or eight (8) pounds with ten pounds really being the size that jump starts the heart. But most of us fish elsewhere. Think There Aren't Big Bass Where you Live and Fish? Are largemouth bass heavier than five pounds common? Take a look at the following state records. Forty-nine out of fifty states have largemouth catch records of seven pounds or greater. As is illustrated by the data above, largemouth lunkers are clearly more common, if not in numbers, certainly in where they can be found. Where they can be found is most anywhere you fish. They are, nevertheless, rare in numbers. Remember, only 1-2% of all largemouth reach the five pound mark. Big bass fishing for a lunker is made even more of a challenge because most of us don't fish where they hang out. Where big bass are to be found most of the time is where fishing is often the most difficult, deep or in heavy cover, or both. You'll notice I said most of the time. Big bass are often where you wouldn't expect them to be. In very shallow water for example. So we fail to fish for them there. Truth is, though they hang close to their home range, which is invariably deeper on average than you will find smaller bass and closer to deeper water, they do venture outside it. Moving shallow to feed and deep to escape perceived danger or uncomfortable changes in habitat. Just as human teenagers are sometimes impulsive and carefree, it can be said that younger, smaller bass are not nearly as aware of their surroundings and are less wary and more willing to go where danger awaits. They'll chase a lure quite a distance while the big,mature largemouth females just won't do it. Anglers who focus on big bass fishing will tell you big bass are solitary, ever alert, territorial, aggressive and cautious chow hounds. A sense of ever increasing wariness characterizes the lunker bass and contributes to the difficulty of catching them. Big bass tend to be home bodies. They know their home territory intimately, having chosen it because it provides all they need to survive and even thrive. As a consequence, they defend it against intruders and rarely venture great distances from it. All these personality and behavior traits contribute to the difficulty of catching big bass on a regular basis and are why it requires a commitment of time and resources to big bass fishing. Big bass fishing success requires two primary considerations if you're to find the few spots where lunkers reside. One is the comfort zone water depth of lunker bass and the second is the structure within that zone to which they are drawn. You can confidently expect these zones to be in water that is ten, twelve maybe fifteen feet deep. It's what is commonly viewed as the transition area between shallow and deep water. Shallow water provides bass opportunity to feed, deep water close by an escape route from danger. Bass in general, but especially lunker bass, prefer a stable environment and water in the 8 to 15' range is often the most stable. Shallow water is the most susceptible to the influences of changing weather while deeper water is continually changing in levels of saturated oxygen and stratification. This is the zone, when combined with appropriate cover type and quantity, where the big bass will establish a home territory and focusing big bass fishing efforts pay off. Large, mature largemouth bass do stake out a home territory. But this does not mean they lay like a glob on the bottom waiting for a meal or intruder to swim by. Depending on the season, they migrate out daily, sometimes several times each day, to shallow water in a search of a meal. They then return, as contented as a baby on a schedule, belly full, to their home cover. Here they will rest in relative calm, alert to danger or an unwitting, easy meal that ambles by. When they are in this state they are not in a feeding mode, inactive and virtually not catchable. If you're focusing on big bass fishing you will catch big bass most often during their periodic migrations. Understand that the comfort zone of big lunker bass is not in the shallows, close to the bank, though they must often travel there to feed. So when your engaging in dedicated big bass fishing move off the bank. Seek out water that's 10-15' deep with cover like submerged trees, stumps, grass or any type that provides overhead cover. Try to identify the "trails or routes" lunker bass use to move to and from their home to shallow water. Fish these routes if you want a hawg. All this means that when big bass fishing, you best fine tune the way you hunt for them and the techniques you use to catch them. 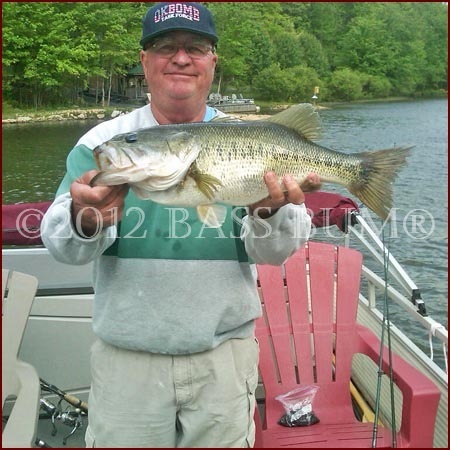 Big Bass Fishing Structure - is a change in the bottom of a body of water. Examples would be creek-channels, humps, rock piles, bluff walls and points. Within structure there are breaklines. Breakline a hard edge where there is found a distinct change in depth. Examples would be the edges of a channel or a stair step slope. Migration occurs when bass move along a route from from shallow to deep water or vice versa. This movement almost always follows a path of breaklines and cover along those lines. As we humans stop to grab a bite or a brief rest when on the road, so too do bass. Their pit stops, if you will, include stumps, weed beds and brush piles. So when is the best time for big bass fishing? We've all been taught to expect the best bite will be early morning, late afternoon and early evening. This is certainly true for bass fished for and caught close to the shore as bass large and small move shallow to feed during these periods. But it's interesting to note that many professional bass anglers catch their biggest bass during the hours between 11:00 a.m. and 2:00 p.m. These are the very hours I've always been told I should head in for lunch and a nap before going back out! The reason for this may be that when the sun is at its highest point in the sky that is when the greatest amount of light and heat penetrate the deepest into water. The theory is that plankton blooms are triggered as a consequence. Baitfish are attracted to feed on the bloom and what follows? Our buddies, the largemouth and smallmouth bass. What about the moon and its influence on big bass fishing? You can read a dozen articles on this and get as many opinions. Everything from "it's total hogwash" to " I plan my fishing completely by the phases of the moon". Despite my personal skepticism this subject deserves in depth coverage and will be covered in depth in another section of this site. Like all bass, big lunker bass behavior and where they choose to locate is also affected by the seasons. Big bass will move around their home territory as the seasons evolve but these moves are usually contained within a quarter mile area. Spring will find them in a bit deeper water than smaller bass. You can count on them holding close to, though not directly on visible cover along the first breakline that's close to a spawning area. Summertime heat will push them to deeper water or alternatively just deeper in cover. The increased lake traffic in summer has a negative effect on the characteristically antisocial lunkers. Some will head out to main lake points and humps in deeper water where they will suspend a good bit of the time. We all know, or should know, that fall finds abundant baitfish moving into lake coves. Following them are big mouth bass, mostly of moderate to small size. The hawgs are there too, but most likely will be found dominating the best piece of cover in a cove or lurking deep under the baitfish picking up shad drifting downward after being stunned in the melee above. In winter big bass may be found shallow or deep. They will seek out the best cover. In more shallow water bodies they can be found in heavy grass or dominating a prominent piece of cover in mid-depth water. They will also move to bluffs and other sloping structure. This gives them the security of being able to quickly move vertically to deeper water without having to move any distance horizontally. Once Big Bass Are Found, Then What? Most anglers never catch a lunker bass weighing five pounds or greater, even fewer catch them on artificial lures, at least on a regular basis. Catching big fish, particularly your biggest largemouth bass, is more likely to happen with the use of live bait or the careful choice of artificial lures and a slow presentation. Are there lures that are big bass fishing specific? Lures that are specifically for big bass or are all lures made for bass fishing potential hawg catchers? I ran across a quote by a fisherman somewhere in response to that question that, "Elephants eat peanuts." I also know a guy who is very adept at catching big bass on 1/16 oz crappie jigs. So I'm not one who has an unwavering belief that big bass take only big lures and big baits. It seems, however, that the size specific personality and related behavior traits of big bass probably do tilt their food choice to larger meal items. We know they won't expend much energy chasing prey. We know they focus on prey that promise the greatest return in energy and protein for the least amount of energy spent catching it, and that means larger prey. Many pro bass fishermen believe that to catch big bass you must commit yourself to big bass fishing by using only large lures fished very slowly. They also feel that an angler, by focusing on catching a record largemouth bass with such lures and techniques, will necessarily exclude catching numbers of bass.